The hold-down cylinder of the shearing machine is driven by the hydraulic system to press the steel plate, and the left and right oil cylinder to drive the blade up and down movement. The upper blade on the blade carrier and the lower blade fixed on the blade holders adopt reasonable blade clearance. Shear force is applied to the metal sheet of various thickness and separate the sheet according to the size of the required fracture. Shearing machine is widely used in all kinds of metal materials, to meet the various demand for direct shearing. It is mainly applied in steel manufacturing, shipbuilding, automobile, container manufacturing, and switch electrical appliances, machinery manufacturing, light industry etc. The shear plate machine can be divided into two categories: hydraulic shears and mechanical shears. Due to the large energy consumption and excessive noise of mechanical shears, the hydraulic shearing machines are much more widely been used. hydraulic swing beam shears and hydraulic guillotine shears. One blade one the shearing machine does the reciprocating linear motion relative to the other blade to realize sheet metal cutting purpose. The upper blade carrier of the shears is swung around the pivot. A hydraulic-driven swing beam shears. Using multiple disc scissors to cut the coil into multiple strip with the required width. Using multiple disc scissors to cut the metal plate into multiple strip with the required width. The plate is processed into any shape by step. The shearing machine with a pair of rotary blades to cut plate in the straight line or curved line. 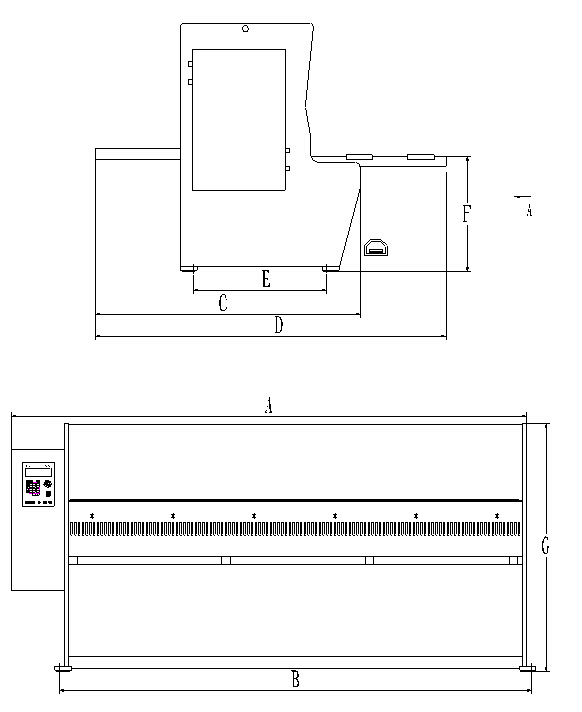 A machine with two functions of punching and cutting. 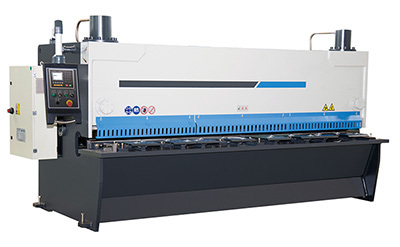 A machine with two functions of metal plate punching and cutting. A machine with three functions including plate punch, plate shearing and section shearing. 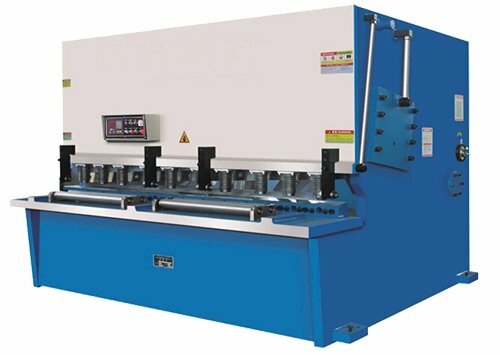 A machine with four functions including plate punch, plate shearing, section shearing and notching. Special shearing machine for steel section. Special shearing machine for bar material. The upper blade of alligator shear is in scissor motion. Special shearing machine for reinforcing bar. Special shearing machine for precise shearing bar. Special shearing machine for slab. Special shearing machine for scrap steel. Special shearing machine for billet. The frame is welded with steel plate, which includes the left, right board, worktable, clamp holder and fuel tank. A hydraulic cylinder and sliding block guide support are installed on both sides of the rack, which is a pushup mechanism that can control the clearance of blades. The hydraulic hold-down cylinder on the clamping device can tightly press the plate for shearing. Fixed upper blade, connect with the hydraulic cylinder, do up and down straight movement, pass shear force, achieve the cutting purpose. 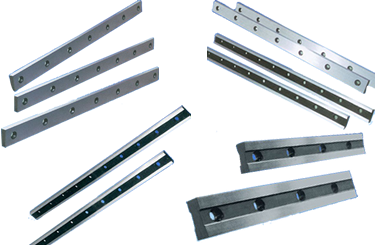 In addition, the backgauge mechanism is also fixed on the blade holder to realize the positioning of the shear plate size. The upper and lower shear blades made of high standard steel can suitable for shearing steel from low carbon steel to stainless steel sheet, upper and lower blade has four interchangeable cutting knife, improve the service life of the blade. Fixed on the blade holder, including the backgauge regulating motor, micro dynamic adjustment mechanism, backgauge lifting mechanism, the digital display device, transmission screw, guide bar, etc. The movement of shearing machine backgauge is driven by the motor, and driven the running of backgauge stopper plate to realize cut-to-length cutting. The fuel tank is installed on the oil tank base behind the shearing machine, the left side of the tank is the hydraulic integrated valve block, hydraulic oil pump and main motor. The left side of the tank is equipped with an oil gauge and the hydraulic oil adding to the middle level of the gauge is ok. The best shear force can be achieved according to the gap between the upper and lower blades of the shear material and the plate thickness, which can protect the life of the blade and guarantee the product quality. Rule of adjustment: generally adjust the gap of 10% of the thickness of the cut material. There is also a side retaining device attached to the work table, which is designed to ensure that the shear plate is perpendicular to both sides. The finger protection plate of the shearing machine is installed on the machine clamp holder, which is mainly used to control the safe distance of the fingers. In order to ensure the safe distance of the finger, the position of the finger protection plate must meet the mechanical safety standard. Note: The above dimensions are in accordance with mechanical safety standards. When placing the plate in the backstop block, the finger should not be placed between the plate and the shearing machine table, in case the plate is pressed against the finger during the pressing process. When the backgauge block is not in the position, the plate should not be pushed through the finger protection plate to avoid scratching the finger. In order to prevent the moving of the plate during the cutting process, the hold-down cylinder is adopted to press the plate firmly. The function of electric system mainly includes start oil pump motor drive oil pump to provide the driving force for hydraulic shears, supply control power; The control circuit is mainly connecting the solenoid valve and oil pressure based on operation instructions to drive the knife carrier up and down movement to achieve the shearing purpose. At the same time, the electric control the stroke of the blade, the back and forth movement, to lighten the alignment line, increase and reduce the gap, and adjust the shear angle. It consists of the main oil pump, hydraulic system, hydraulic cylinder, pressure cylinder, hydraulic pipe, etc. Hydraulic oil pump provides shearing pressure for hydraulic equipment. The hydraulic system mainly controls the system pressure and hydraulic oil direction. The hydraulic cylinder is used to drive blade holder movement to achieve plate shearing function. The hold-down cylinder is mainly pressing the workpiece to ensure the precision of the workpiece. before starting, especially if the accumulator needs to be re-inflated, it must check the position of the ball head. (1) start the machine to run a certain number of cycles, and make sure that various thickness of the plate is cut (from thin to thick) under normal conditions for testing purpose. The operator must be familiar with the general structure and performance of the shearing equipment. The operator must master use and maintenance standard of the shearing equipment. Lubricate the shearing machine according to lubrication provisions, check the oil quantity, oil quality, and cover the oil cup. Aligning cutting blade before the operation. The blade clearance shall be determined according to the thickness of the shear plate, generally between 5 ~ 7% of the thickness of the cutting sheet. Each clearance adjustment applies the hand to rotate the flywheel to make the upper and lower blade reciprocate once, and check the clearance with the feeler gauge. According to the requirement of the shearing workpiece, loosen the anchor bolt, adjust the position of the retaining plate, and strengthen it. The shearing machine should be run 2 ~ 3 times before work, make sure the lubrication is good, and the operation can be done without exception. It is forbidden to using the percussion method to loosen the backgauge device or adjust the clearance of the blade. 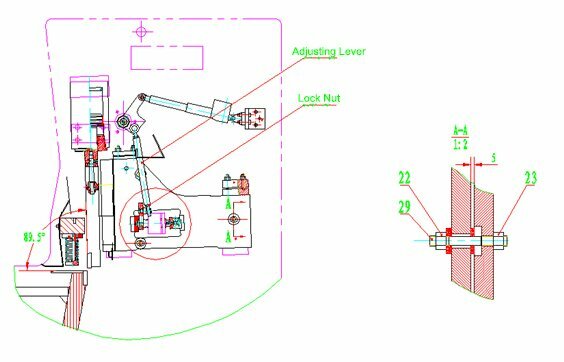 When adjusting the clearance of guide rail and blade clearance, the shearing machine should be stopped before carried out the adjustment. It is forbidden to hand in the cut area or to pick up or catch the materials during the operation. The blade must be sharp and should be sharpened or replaced in time for damage or wear or delay. When cutting the plate with different thickness and materials, the pressure of clamp spring and blade clearance should be adjusted properly, to prevent spring breakage or damage the blade edge. It is forbidden to cut steel bar with the hydraulic shearing machine, Other items must not be placed on the workbench so as not to get into the blade and damage it. It is prohibited for the operator to leave or to hold the equipment operation under others’ watch. 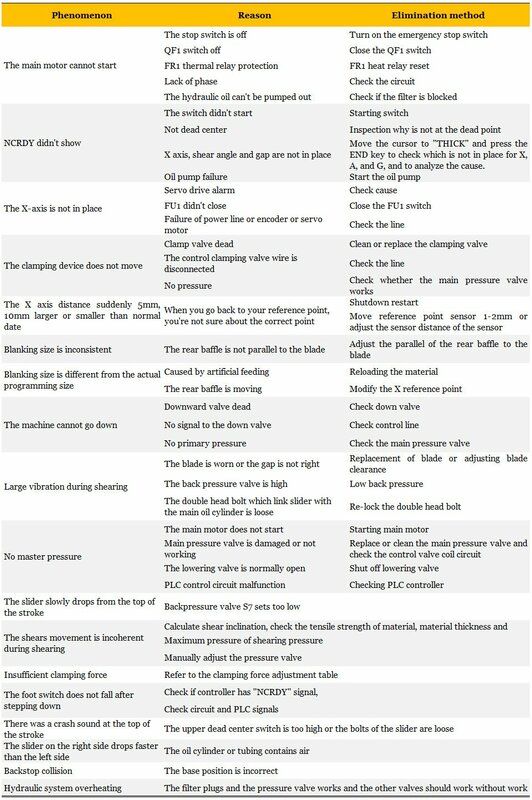 Pay close attention to the clamping mechanism and clutch and brake for abnormal failure; during shearing the operator should be concentrated, if detection abnormal phenomenon of the shearing machine, the operator should stop shears immediately, cut off power, inform concerned personnel to repair. Before leaving work, should cut off the power, wipe off the equipment, make a check record. It is forbidden to cut excessively long and thick plate, not to shear the high-speed steel, tool steel and cast iron. The clutch should be off before starting, and the motor should not start with the load. Before starting, test the empty cutting, after everything works well, then start cutting operation. It is forbidden to cut explosive articles, rods, overthin workpieces and non-metal materials. Notice whether the pull rod fails, whether the fastening screw is strong. The finger cannot enter the blade mouth when feeding. 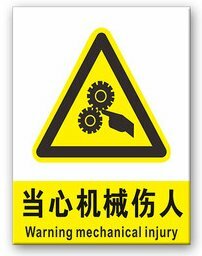 It is strictly forbidden to cut two workpiece by two operators at the same time. No standers behind the shearing machine. （6）Note: the shearing thickness of the plate shears refers to the material of Q235 steel plate (shear strength 450 Mpa), the thickness of the plate tensile strength increases, the maximum cutting thickness decreases. For the hydraulic shearing machine with the maximum cutting thickness of 16 mm, the shearing thickness of Q345 plate is 13 mm, while for 8 mm cutting capability of Q235 steel plate, for Q345 plate the thickness is 6 mm. These blades can cut ordinary cold rolling plate and most of the stainless steel plates. When cutting mass stainless steel or hard materials, the raw edges may be generated when cutting. In this case, we can provide the optional blade for 6.5/10mm shears, hardness HRC 56/57. 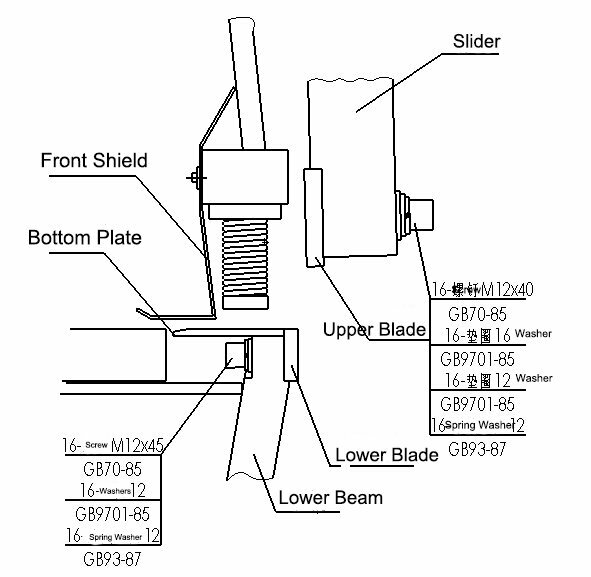 Blade angle and clearance calculation depend on the standard material. The gas cabinet has a diagram to adjust the data at any time to get better shear results. For example, sometimes increasing “tilt angle” to reduce the cutting edge. But it may be deformed when cutting the strip. Sometimes reducing the “tilt angle” can reduce the deformation, but may produce burrs. The width of the shearing strip should not be less than three times the thickness of the plate without requiring precise shearing. In the precision shear, the width of the shear material should not be less than 6 times the thickness of the plate in case of distortion or bending. The greater the width of the shear material, the smaller the deformation. When setting X = 100mm, the parallelism allowance of the specimen is 0.15mm in any 1000mm length. When setting X = 100mm, the straightness of the specimen is 0.25mm in any 1000mm length. The repeat positioning accuracy of X-axis is 0.02 mm. The length of the specimen can be plate shearing width. Specimen tensile strength σb≤450 mpa. First mount blade, bolt M12*40 screw on the upper blade, temporarily not bolt the screw at the two ends. 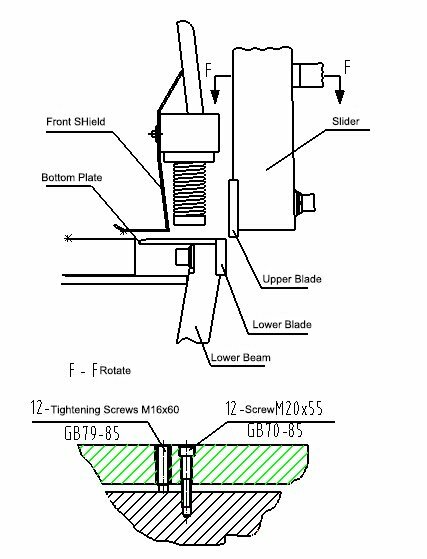 Resist the upper blade with a stick, tighten the installed M12*40 screw in turn when the surface of the upper blade is fully pressed with the contact surface of the slider. Drop down the slider, turn off the pump motor, and install the M12*40 screw on both ends of the blade, tightening the screw. The tightening torque of the blade screw is 35N/M. Start the oil pump first and make the slider rise to the dead point, when the oil pump is turned off, load the blade and twist the hexagon screw of M12*45 (Don’t twist it too tightly for the time being). Press the blade with a stick to make the blade close to the bottom of the work table, screw the M12*45 screw in turn according to requirement. The blade clearance directly influences the quality of the shear surface and the life of the blade. Generally, the standard clearance between upper and lower blade is 0.02mm, which is equivalent to the thickness of a normal A4 paper. In the installation process, by using the shearing machine to cut paper is the most commonly used method for adjusting blade clearance. The cutting edge of the blade is under too much force, which will damage the cutting edge directly and make the cutting edge not sharp. 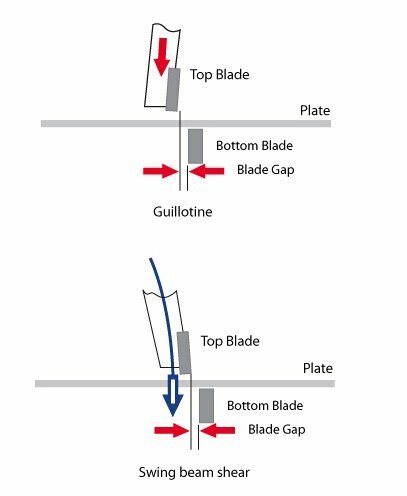 Affected by other factors, the dislocation of the upper and lower blade lead to upper blade cut lower blade, which causes the cutting edge of the blade to crack. This situation is very easy to hurt the operators. This is also a mistake that non-professionals make when installing blades. In order to prevent the blade of the shearing machine to hit each other, they simply enlarge the gap, in fact, this is not correct. — The size of the plate which is cut off by the shearing machine is not accurate. Besides, there will be a lot of metal burrs on the cutting edge, especially for cutting thin sheet metal materials. — The sheet metal will be nipped by the upper and lower blade and it is very difficult to take it out. This will not only wear out the blade but may also lead to the shearing machine stop. However, this condition will not be obvious for cutting thick plate. After long use of the shears, the gap between blades needs to be adjusted. Generally, we recommend setting the blade clearance around 10% of the metal sheet thickness. 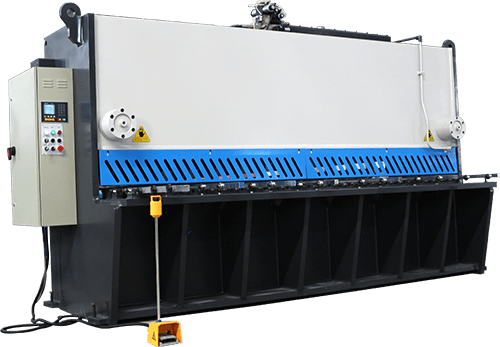 The lower blade is fixed on the hydraulic shearing machine, and the blade clearance can only take the lower blade as the baseline to adjust the upper blade to achieve the ideal blade clearance. The minimum clearance should be adjusted between 0.05-0.1 mm. Such as range at the ends of the blade clearance, can be adjusted by adjusting the pole (see below figure), (loosen the lock nut at the bottom of regulating lever, turn the adjusting lever until clearance is equal on both ends of the upper and lower blade, twist lock nut). 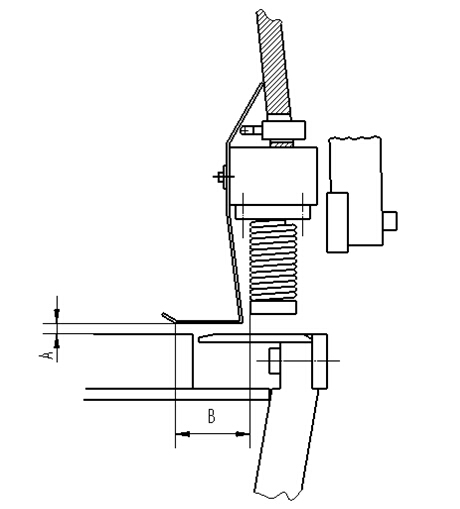 If the clearance between lower blade does not conform to the requirements, can be adjusted by referring to the following figure, to adjust allen screw M16*60 and M12 * 65 to adjust the blade gap between the blade, in order to make the parallelism allowance of the upper and lower blade within 0.05 mm. Of course, to get the ideal blade clearance, the M12*65 and M16*60 inner hexagon screw must be adjusted repeatedly. As we put at the beginning of the post, the sheet metal shearing is realized by upper and lower blade movement driven by hydraulic system. The daily maintenance of the shears includes daily lubrication, tank cleaning and cleaning of the shearing machine. When any maintenance is carried out on the shearing machine, the machine must be cut off. 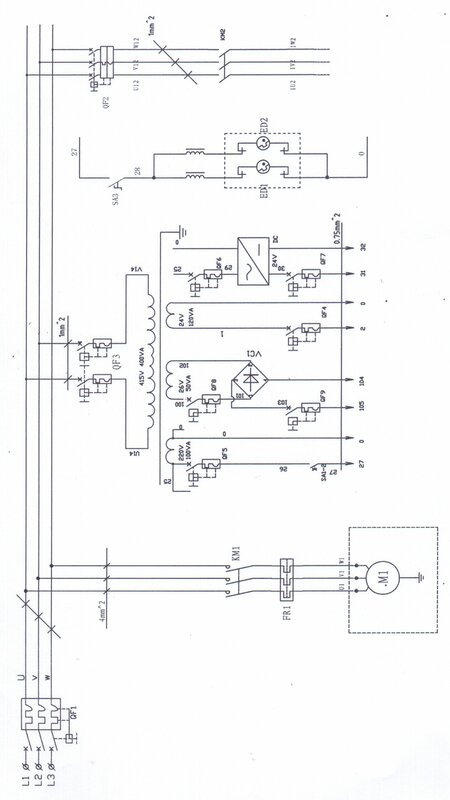 The power must be switched on for 20 seconds before the capacitor and the servo amplifier discharge completely. If can’t lower the slider, pad with a wooden block, pay attention to the pressure within the system due to movement of the slider valve removal. Hydraulic oil should be replaced after 2000 hours operating for the first time, later replace the oil after every two years or 4000 hours work. Prior to removal of the tank cover and access to the tubing, the area must be cleaned to prevent contamination. Draining the hydraulic oil when the hydraulic oil is warm, and the slider is at the upper dead point. Before the shearing machine is reworked, starting oil pump to circulate the hydraulic oil for about an hour. In order to ensure the reliable operation of this shearing machine, the following procedures must be paid attention to. This procedure is graphically represented. The following listed time is based on the 5 days per week, working 8 hours a day. For swing beam shears, the manufactures usually name it QC12K/Y, while for guillotine shears, QC11K/Y is adopted. You can click below link to view both the instruction manual for swing beam shears as well as guillotine shears. When the oil of the main oil line into three-position four-way directional control valve S6, S6Y1A get the electric. The oil enters into S6B via S6P, open one-way valve S8, and oil enter the lower chamber of the right cylinder(The left and right cylinder is connected in series), make the oil fluid from the right tank into the lower chamber of the left cylinder. The oil in the upper chamber of left cylinder enter S6A and enter S6T, to make the slider go up. If S6Y1 get electric, the oil will enter S6A via S6), then enter into the upper chamber of the left cylinder, then enter the upper chamber of the right cylinder. The oil will overcome the pressure of back pressure valve S7 to enter S6T via S6B, then back oil tank, to make the slider go down. 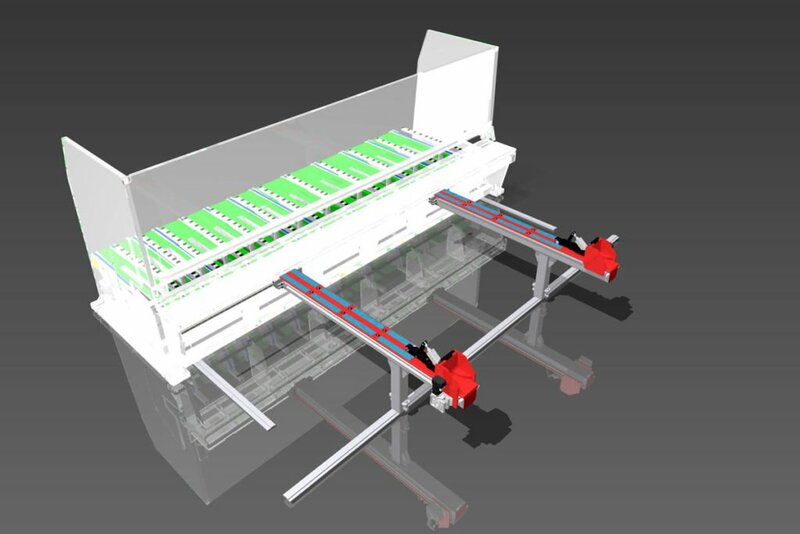 If there is no set value in the shear angle of the shearing machine, the sliding block cannot operate up and down. Therefore, the shear angle must be in the state of controller setting. 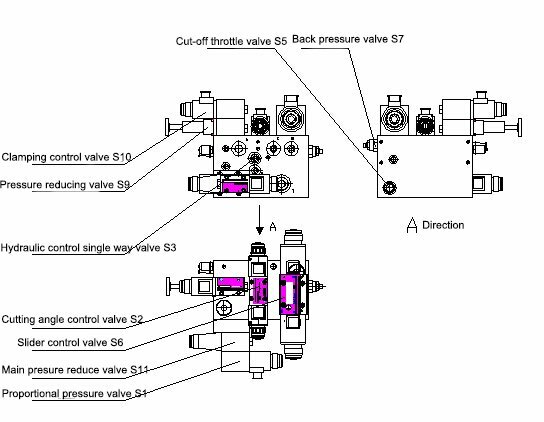 When the oil into three-position four-way directional control valve S2, and Y2A get electric, then oil will enter S2B via S2P, open hydraulic control single way valve S3, enter lower chamber of left cylinder and upper chamber of right cylinder cause the upper chamber of the left oil cylinder cannot form a circuit, so the left oil cylinder does not move. When the oil in the lower chamber of right cylinder back to oil tank via S6T, back pressure valve S7 and S6B valve, the cutting angle becomes small. 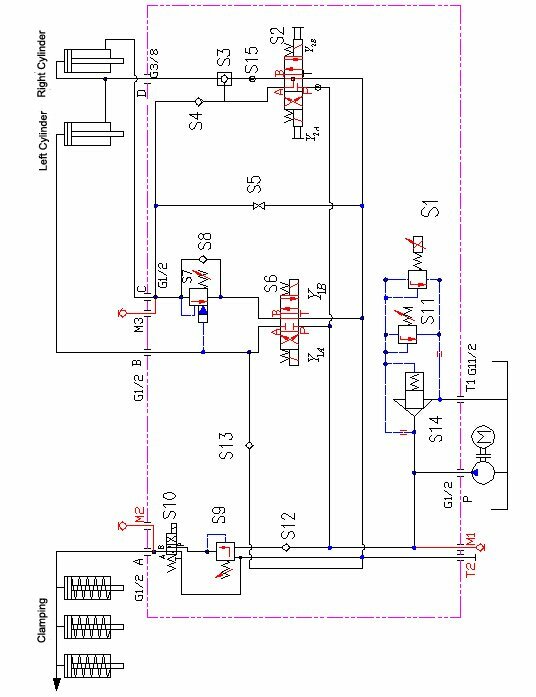 On the contrary, if Y2B get electric, the oil will enter S2A via S2P, open single way valve S4, and enter lower chamber of right oil cylinder. The oil in the upper chamber of the right cylinder can only enter hydraulic control single way valve S3 (At this point, the S3 valve is in the open state), oil enter S2T via S2B, the shearing angle turns big. When the oil enter directional control valve S9 via clamping proportional control valve S10 (Its proportional pressure is controlled by electrical ark pressure adjusting switch), when S9 get electric, the oil will enter S9A via S9P, then enter the upper chamber of clamping device, press the clamping piston down to form compression, when S9 lose electric, the clamping piston will be press upward via clamp’s built-in spring, which forces the oil in upper chamber of clamping cylinder enter S9T via S9 valve, the clamping device is reset. You can check out one old post to learn the difference between hydraulic guillotine shears and swing beam shears. Under the leadership of sheet metal workshop director, learning to abide by the regulations of the company, obey leadership arrangement, staff solidarity, positive efforts, acting on saving, do good work, to produce qualified products. Responsible for daily routine maintenance, check, repair, adjust and tighten the shears, and keep records. Be familiar with the safety technical operation procedures of the work, and strictly follow the safety technology and operating procedures. Master the normal operation method of the shearing machine, can accurately judge the abnormal situation of the machine, and take emergency measures timely and correctly. Operate strictly according to the operating rules, the equipment can be started when the working environment is normal. Check whether the oil storage tank is sufficient, and check valve and pipeline after starting the oil pump, and the pressure should meet the requirements. Observe the resistance of the blade movement and start cutting when the test is normal. It is strictly prohibited to start suddenly. 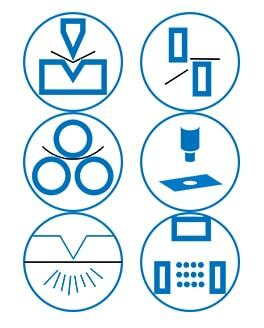 It is not allowed to cut the laminated sheet material, not to trim the edges of the plate with burrs, and it is forbidden to shear the narrow plates and short materials that can’t press tightly. The clearance between the blades shall be adjusted according to the thickness of the sheet, but shall not be greater than 1/30 of the thickness of the plate. The blade should be fastened firmly, and the upper and lower blade shall be kept parallel to prevent accidents. The edge of the blade should be kept sharp. If the edge of the blade becomes dull or cracked, the blade should be repaired and replaced in time. When shearing, the pressure material shall be firmly pressed on the plate, and shall not be cut under pressure. The hydraulic valve is not allowed to adjust by yourself. It is forbidden to use the shearing machine for super length and super thickness, and it is not allowed to shear the steel, high carbon steel, alloy tool steel, cast iron and brittleness material. Frequently check whether the fastening screw is loose. Do not operate the shearing machine alone. It shall be coordinated by two people to deliver the material, control the dimension accuracy and materials taking, and confirm that the one person shall be unified in the command. Adjust the clearance of the shearing machine according to the thickness of the shear plate. It is not allowed to cut two different specifications and different materials. The fingers of the operator should stay at least 200mm away from the scissor shears mouth and leave the compression device. For the cutting thickness of the hydraulic swing beam shears, it shall be determined according to the curve diagram of the relationship between plate limit strength and plate thickness. No other items should be placed on the workbench. The cleaning must be carried out after stopping the shearing machine. After adjusting the blade (alignment), run the shearing machine in empty for the test. Before leaving work, should pile up the finished product, clear the field, cut off the power, lock the switch box. FOR: max shearing thickness = 12mm or 18mm. I have no idea that hydraulic shearing machine is helpful. I agree that, hydraulic shearing machine has very powerful mechanism that makes material cutting very easy. Thanks for sharing..!! You’re welcome. And hope it is helpful for you.